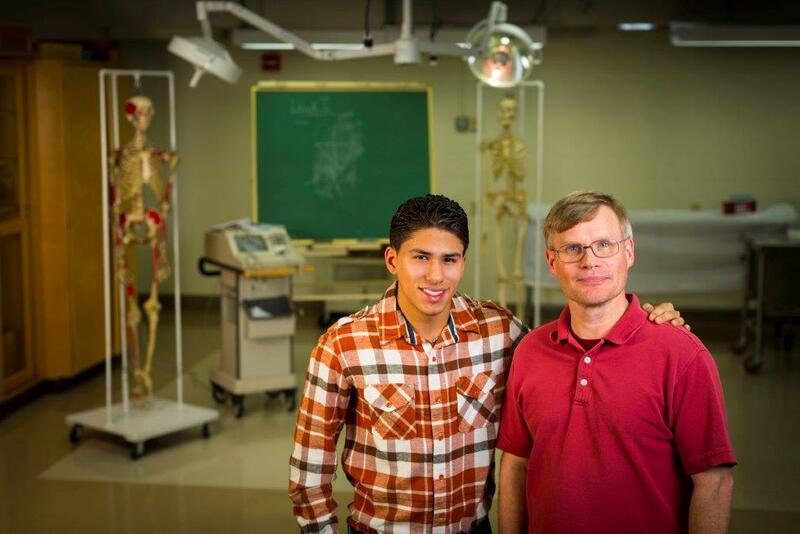 Christian Hernandez credits his success to Prof. Andrew Lokuta, a CIRTL mentor. CIRTL News Release MADISON, WI – Forty-six research universities that produce one-third of U.S. doctoral degrees in science, technology, engineering and mathematics (STEM) now are members of the Center for the Integration of Research, Teaching and Learning (CIRTL), established in 2003 with support from the National Science Foundation to improve the teaching skills and increase the diversity of future STEM university faculty members. CIRTL, operated within the Wisconsin Center for Education Research (WCER) in the University of Wisconsin–Madison’s School of Education, added its 25 newest members as a result of its third expansion, completed Feb. 15. As CIRTL members, universities commit to developing local learning communities that promote proven teaching and mentoring techniques for their STEM graduate students. CIRTL is increasing the number and diversity of STEM professionals by improving the STEM learning of students at all U.S. colleges and universities. With so many graduate universities now part of CIRTL, Mathieu foresees better prepared and more diverse STEM faculty members working across thousands of colleges and universities due to the training and support of CIRTL local and national learning communities. CIRTL stresses the use of evidence-based strategies proven to promote active learning and help STEM students from all backgrounds succeed and complete their degrees. Teaching strategies include: connecting classroom topics to real-world situations, promoting inclusive learning, encouraging teamwork through shared projects and study groups, continually assessing student progress and using research skills to advance effective teaching practices. Graduate students in a CIRTL learning community collaborate on a teaching project. CIRTL’s member universities develop their own programs, all built on the CIRTL core ideas of teaching-as-research, learning communities and learning-through-diversity. For example, the CIRTL learning community at UW–Madison is called the Delta Program in Research, Teaching and Learning. It offers its own robust schedule of courses, programs, events, internships and resources. In addition, Delta collaborates on cross-network projects with CIRTL partners and participates in national offerings, such as MOOCs—massively open online courses—combined with local, in-person group meetings. One of those students, Allison Rober, is now an assistant professor of biology at Ball State University. Her participation in Michigan State University’s CIRTL learning community, called FAST, gave her an edge over other candidates vying for her current position. “The goals of CIRTL aligned with many of the mission statements for many universities, so we were speaking the same language and that impressed them,” she says. As a Ball State faculty member, Rober continues to participate in CIRTL programs online. “It’s an incredible continuing education opportunity. There aren’t any similar professional development programs here on campus, so it’s a great way for me to stay current on STEM education as an early career faculty member,” she explains. This year, Rober initiated a scientific teaching program for graduate students at Ball State to pass on the invaluable information and skills that she learned in FAST. CIRTL is a research experiment in itself, testing whether a mission-driven university network can advance the education and impact of tomorrow’s STEM higher education faculty. The project is supported by the National Science Foundation, Great Lakes High Education Corporation and Affiliates, and the Alfred P. Sloan Foundation. ABOUT CIRTL: The Center for the Integration of Research, Teaching and Learning (CIRTL) began as a National Science Foundation Center for Learning and Teaching in Higher Education. CIRTL uses graduate education as the leverage point to develop a national STEM faculty committed to implementing and advancing effective teaching practices for diverse student audiences as part of successful professional careers. The goal of CIRTL is to improve the STEM learning of all students at every college and university, and thereby to increase the diversity in STEM fields and the STEM literacy of the nation.